Gripping the Dice - CrapsFest! If you pre-set the dice to certain arrangements, grip and toss them consistently to the same spot on the table every time you’ll have a good probability of success. A good grip should meet what we refer to as “The Three C’s.” The Three C’s are Comfort, Control, and Consistency. The grip should be Comfortable for you to execute. Everyone’s hands are different. Some people have long, slender fingers. Others have short, fat fingers. Some people have problems with arthritis in their hands. Some have fingers that are numb due to nerve damage from diabetes or other conditions. Regardless of the shape or condition of your hands, odds are one of the grips listed below will work for you. Find one that is comfortable, then work on perfecting your throw. 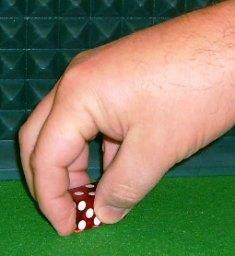 In addition to being Comfortable, the grip you use should result in you having some measure of Control over the dice. In order to maximize control you will want as little skin in contact with the dice as possible. Dice are lightweight and will often stick to your fingers, especially under hot, humid conditions or toward the end of the dealers’ shift, when the dice have been in play and handled by dozens of shooters over the course of an eight hour day. Focus on gripping the dice with the tips of your fingers, not the pad. You also have to develop Consistency when gripping the dice. That means gripping them exactly the same way every time you pick them up, and that takes practice. Eventually you will get to the point where you can grip the dice with your eyes closed, relying entirely on your tactile senses to tell you that you have gripped them correctly. This is the Four Finger Bottom Grip. In grip parlance we usually do not count the thumb as a finger. With this grip all four fingers are aligned on the lower front of the dice. The thumb grips the dice about halfway down the back, centered on the seam between the two dice. As you can see, there is significant skin contact with the dice on this grip, which makes is less favorable than some. This is the Three Finger Top Grip. With this grip the middle finger is centered on the seam where the two dice meet. The index and ring fingers rest naturally beside the middle finger. The pinkie finger is not involved in the grip. As with the Four Finger Bottom Grip, the thumb grips the dice about halfway down the back, centered on the seam where the dice meet. The Ice Tong Grip is different from the other grips shown in that the dice are gripped on the axial faces instead of the front and back. This grip is rarely used due to the difficulty in executing it properly. However, when the dice are in the right hands it can produce excellent on–axis results. Sometimes referred to as the Five Finger or the Lock Grip, this grip has the maximum amount of skin contact with the dice of all the grips shown. 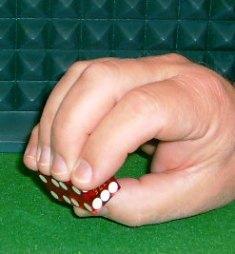 The index and pinkie fingers hold the dice together from the axial faces. 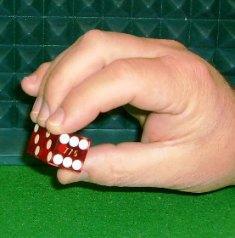 The middle and ring fingers grip the dice from the front, while the thumb grips them from the rear. The dice are gripped very deep, all the way to the deck of the table. Many people start out with this grip because it is comfortable and feels like it gives a measure of control. 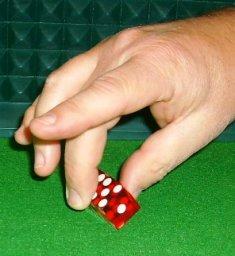 However, due to the amount of skin contact with the dice it a difficult grip to use successfully. The Pincer or One Finger Grip is hailed by many as the best overall grip. However, it can be a difficult grip to learn due to the tendency of the dice to separate at the seam when you apply the grip. 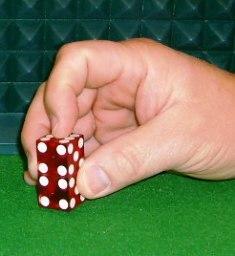 The index finger is placed centered on the seam between the dice on the front face. The thumb is centered on the seam on the back face. Tip: Use slight pressure on the axial faces of the dice with the index and ring fingers until you have the dice gripped firmly with the middle finger and thumb – then move them off the dice. The One Finger Diagonal grip is the ultimate low-skin-contact grip. Instead of gripping the dice on the flat faces you grip them on their opposing edges. This is an excellent grip, however, it takes practice to learn how to effect the grip and pick-up in live play. 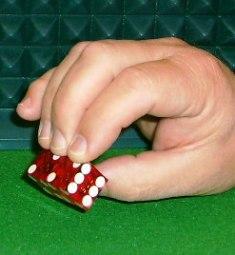 The Three Finger Diagonal Grip is similar to the One Finger Diagonal, but the dice are gripped with three fingers on the front leading edge. Again, this grip offers minimal skin contact and excellent control, however, without a great deal of practice it can be difficult to execute the grip and pick-up in live play. This is the Three Finger Diagonal in the underhanded toss position. Any of the previously discussed grips can be used effectively when tossing underhanded simply by turning your hand over so the palm is up instead of down. Since dice thrown underhanded have forward spin as opposed to back spin, it is possible to get the dice all the way to the back wall with a much softer throw. 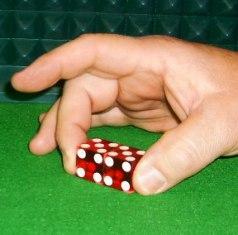 Some shooters prefer to stack the dice instead of setting them side by side. The Stack Grip has many variants. The one shown above is typical of what you will see in live play. Shooters who stack the dice with the same pre-set arrangement every time and consistently toss the dice to the same spot on the table every time increase the probability that they will have a winning hand. There are many other grips than those shown on these pages. When scouting for good shooters at the table, look for players who use the same dice set and grip every time, while tossing the dice consistently to the same landing zone. When practicing, experiment with the different grips until you find one that is comfortable for you while providing some measure of control, then stick with it. Remember the dice should be gripped as lightly as possible. With time your tactile sense will kick in and you will develop a feel for the dice. If you are not sure which grip is best for you, schedule a live session with Heavy. He will evaluate your grip and toss, correct any minor issues and get you started on the right track. 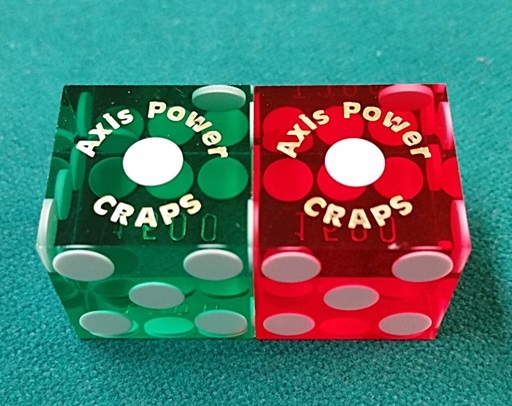 For information on private and group lessons e-mail Heavy direct at axispowercraps.gmail.com.